CES keeps on churning out the big tech stories and the Iconia A700 Tablet from Acer is certainly top of the list. Many analysts and tech journalists are singling this one out as being the one to watch for 2012. The 10.1-inch performance juggernaut boasts a Nvidia Tegra 3 SoC quad-core processor at 1.3GHz with 1GB of RAM. The IPS display supports 1080P resolution and the device comes packed with ports for expansion and I/O with mini-USB, microSD and HDMI all present. You’ll also find front and rear HD cameras ideal for video calls and augmented reality. 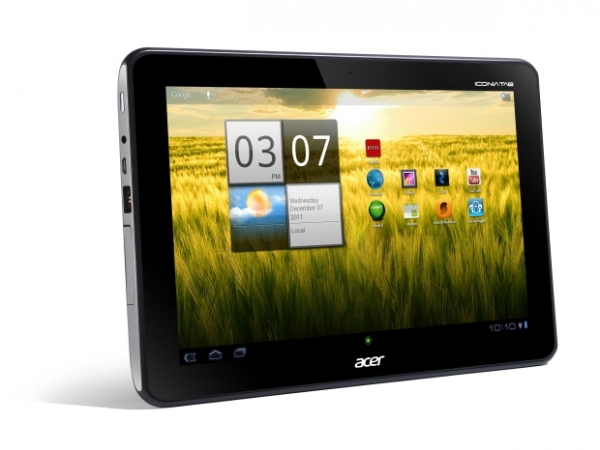 The A700 comes preinstalled with Google’s latest mobile OS Android 4.0 ICS (Ice Cream Sandwich) but includes a slightly customized UI with the Acer Ring interface differentiating it from the rest of the herd. As this is still a prototype device at present there is no release date or pricing information but suffice to say that the Iconia A700 will no doubt be the most anticipated new tablet of the year. However Acer did launch another tablet in the Iconia family that will be ready for purchase on January 15th for the modest price of $329. Running Android 3.2 Honeycomb, with an ICS update expected soon, this 10.1-inch budget-minded slate provides a resolution of 1200 x 800, front and rear 2MP cameras, a mini-HDMI and MicroSD expansion. The CPU comes courtesy of Nvidia’s last generation Tegra 2 chips, theres also 1GB of RAM but a rather disappointing battery-life runtime of just 8 hours. Nevertheless the A200 is a solid and affordable mid-range tablet from a high-end manufacturer, so you can expect solid build quality and performance unlike so many similarly priced cheap and nasty tablets on the market at the moment from tech companies you’ve probably never heard of.